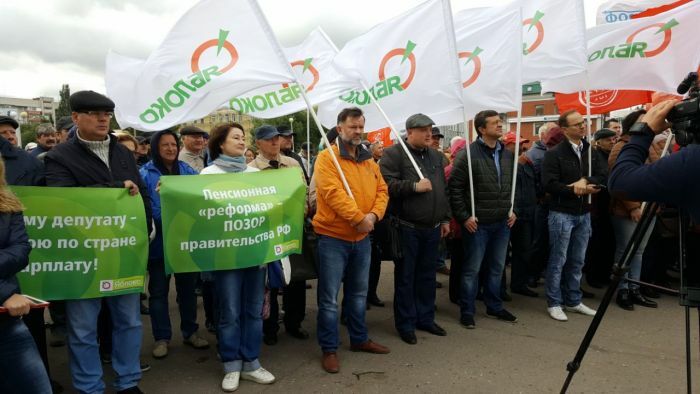 Yabloko activists participated in protest actions against raising the retirement age in 14 cities of Russia. 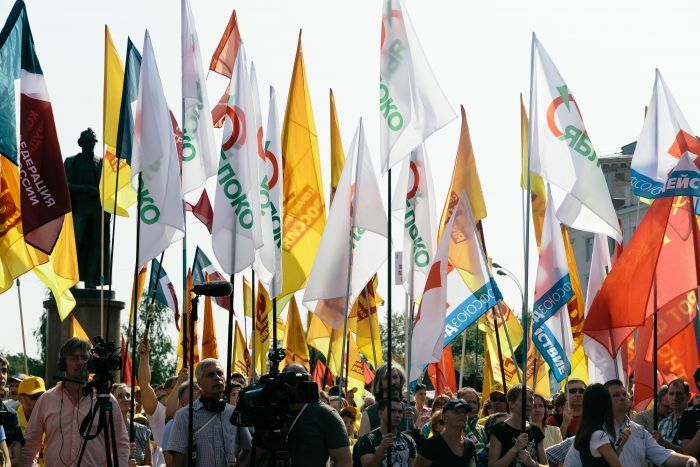 Chair of the party Emilia Slabunova made a speech at the rally in Omsk while Yabloko’s Political Committee member Sergei Mitrokhin delivered his address in Moscow. Over 2000 people took to the streets in Moscow to express disagreement with the government’s pension reform. Sergei Mitrokhin called raising the retirement age “a criminal affair” as a result of which millions of Russians would be deprived of the money they had earned because they simply would not live to see their pensions. According to Mitorkhin, the authorities are being hypocritical when they refer to the European practices.”Why don’t we adopt the European approach to salaries? Or fight corruption and support small-sized business?” the politician said. The politician stated that the government should consider disposing of the reserve funds in a European way as well. For instance, Norway managed to gain over a trillion dollars for future pensioners thanks to the profits from high prices on energy commodities. On the other hand, the Russian government waisted excess profits. Mitrokhin accused Vladimir Putin of trying to cover up the failure of the state policy with pension money.”If you cannot do your job, you must leave and give way to those who can,” he concluded and called upon the government to resign. Leader of Yabloko’s Social Democratic faction Anatoly Golov also took part in the rally. In his address to the protesters he called on the people around the country to take to the streets otherwise “things will only get worse”. 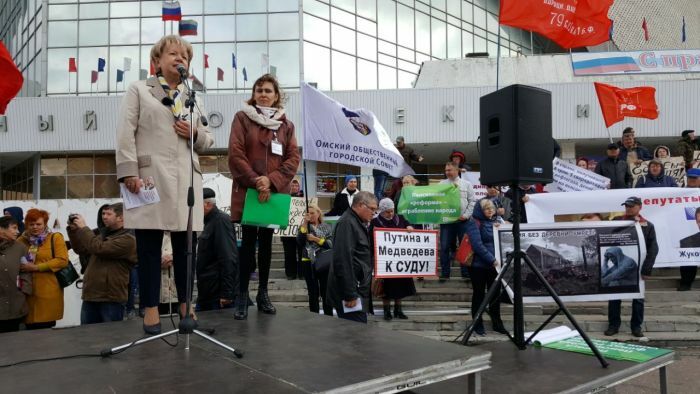 Yabloko Chair Emilia Slabunova made a speech in Omsk, Siberia, saying that “several days ago we listened to Putin’s appeal to Russians to [to accept the pension reform]. What does it mean? It means there is no and there will be no economy in the country. It means that a welfare state is only declared in the Constitution but it does not exist in reality. It means that [Putin’s] explanation of demographic problems as a result of the Second World War and the developments of the 1990s are inconsistent. 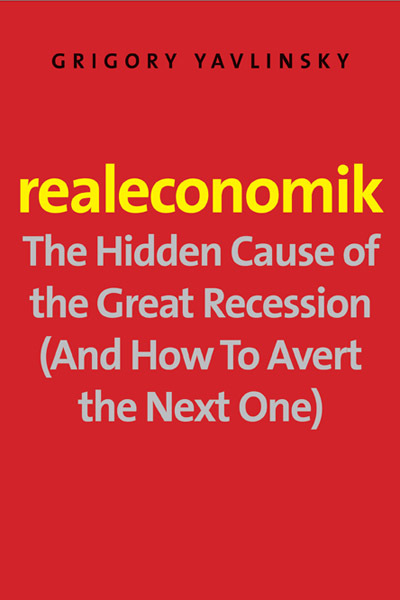 We have all we need in our country – natural resource, talented people and lots of money”. According to the politician, Russia enacted a surplus budget. What is more, the country received excess profit from energy commodities export. Unfortunately, the government spends this money on foreign policy adventures, megaprogects and corruption. Slabunova suggested that the government should carry out a tax reform rather than the pension reform. This would allow to redistribute profits in favour of different regions of Russia and municipalities. She stressed that the present system was the reason for serious social problems in Russia. The politician thanked the participants of the rally for joining the protest.”These problems can be only solved by political means. 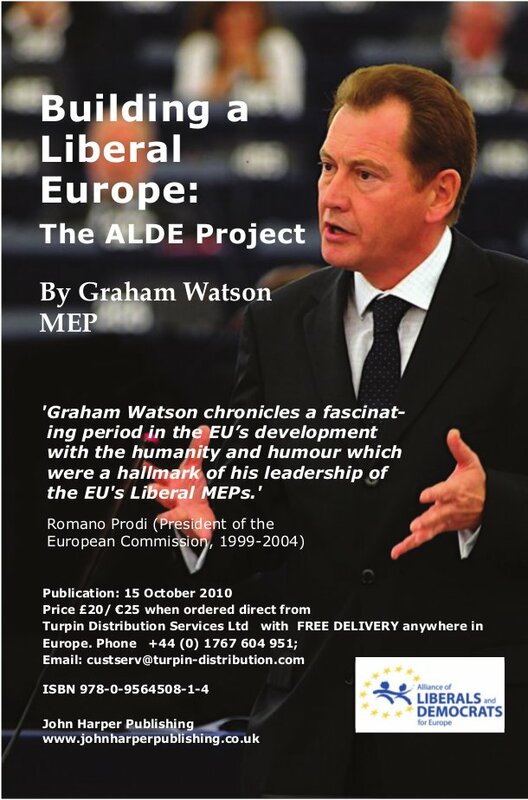 The main reform that we need is the reform of the country’s policy – we need free and fair elections, independent courts and alteration of power. The current government cannot ensure the wellbeing of the population. This is why it must retire,” she concluded. The leader of the Pskov branch of Yabloko Lev Shlosberg also called upon the government to resign. “This government led our country to a political, economic and social deadlock. The authorities have little understanding of the future of the country. They do not care about our future, the future of our children and grandchildren. Furthermore, they want to see themselves in this future – powerful and well provided for,” he stated. “After the presidential election the government decided that they will stay in office forever. But they are mistaken. We, all the people who fight against their illegitimate decisions, are the future of Russia,” the politician told the protesters. Yabloko stands categorically against the governmental project of the pension reform envisaging the increase of retirement age. Today party activist join protest actions against the reform in 15 cities of Russia.